You’ve waited for it since freshman year, and finally, it’s here. Prom! As excited as you are, I’m sure you’re also feeling pressured to look your best. You’ve snagged a date and found the perfect dress and shoes. But, have you thought about your hair? Your hairstyle can take your ensemble up to a perfect 10 or bring it down to a subpar 4. Before you start panicking, hear me out. I know exactly what you need – a half up-half down hairdo! It’s fun, chic, and elegant and stays in place through all the fun you’re having. 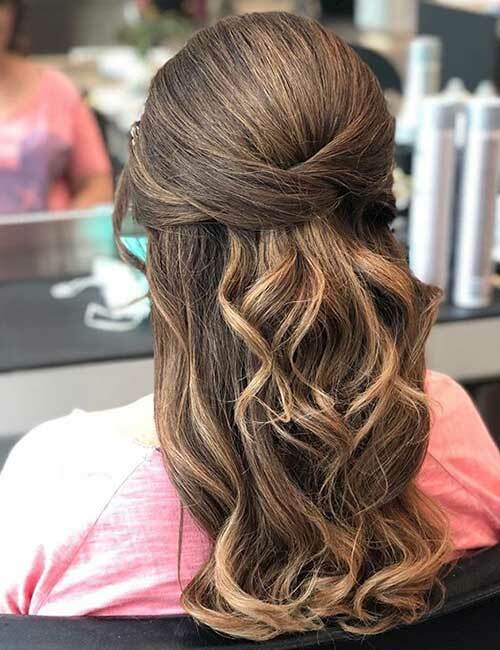 So, I present to you 31 half updos that will make you #promhairgoals. Check them out! Pick up some hair from one side of your head, at the front. Weave it into a braid and pancake it to make it look bigger. Pick up some hair from the other side and repeat the process. 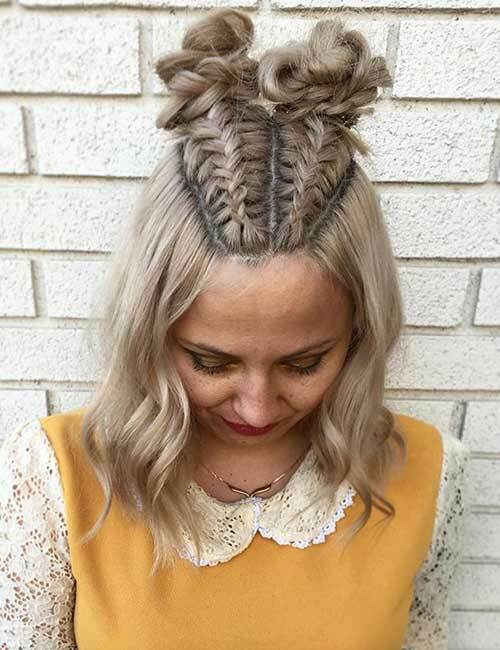 Pin both the braids below the crown at the back of your head. Gather the hair from the front, sides, and crown of your head. You can leave some hair at the front to frame your face. But remember, this hairstyle is messy and loose, so there will be more hair falling out of place. 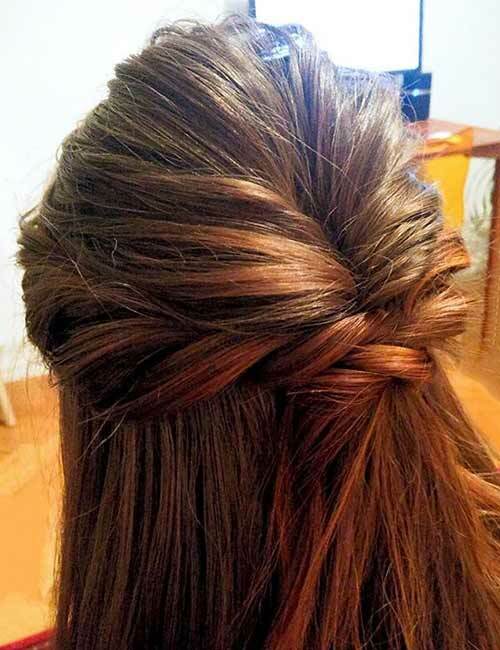 Weave the gathered hair into a loose three-strand braid and tie it at the end with an elastic band. Pancake the braid to make it look big and messy. To prevent any unwanted hair from falling out of the ‘do, spritz on some hairspray and pin the looser sections in place. Create partings on the left and right sides of your head, and gather the hair in between them. This section of hair is commonly known as the mohawk section. Hold this section hair up and backcomb it just a tad, not much. Comb the top neatly and pin the hair at the back of your head, below the crown, to create a nice bouffant. Pick up hair from one side, cross it over to the opposite side, and tuck the rest of the hair under the pinned hair of the bouffant. Use bobby pins to secure the hair in place before finishing off with hairspray. Comb your hair and create two partings in line with the ends of your eyebrows. You can jazz them up by following a zig-zag pattern. 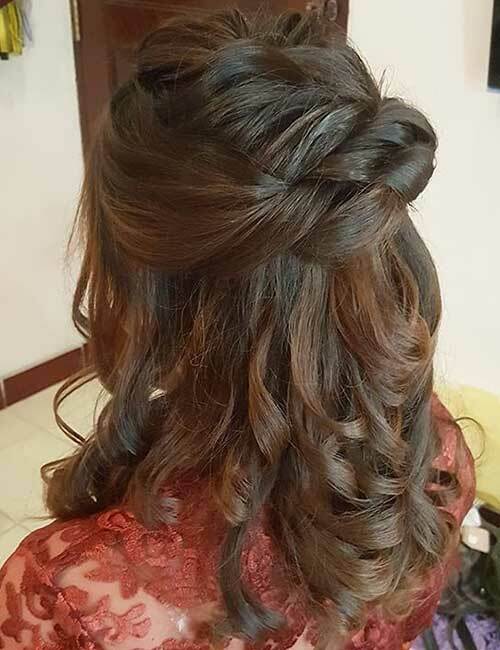 Create a third parting at the back, at the crown, joining the previous two partings. Leave out the section of hair created by the partings and clip up the rest of your hair. Divide this left-out section of hair into three smaller sections with zig-zag partings. 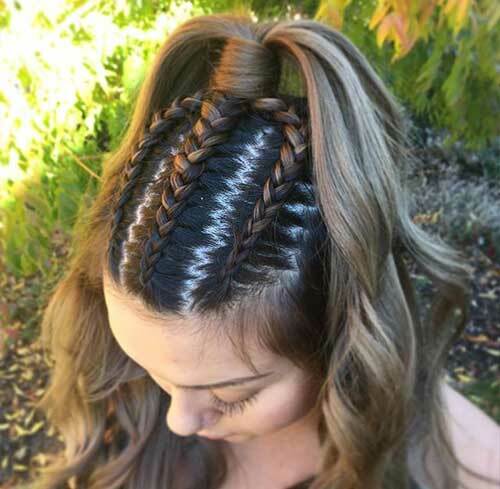 Clip up two sections and begin weaving a Dutch braid with the loose section of hair. Keep adding hair to the sides as you braid. Stop weaving the braid once you reach the back parting and secure it with an elastic band. Unclip the next section and repeat the same, followed by the last section. Join all the remaining hair of the sections together and tie them in a high half ponytail. Don’t forget to hit this half up-half down do with some hairspray. Gather some hair from the top to make a bouffant. You can simply twist the hair at the back and pin it higher up to create the bouffant. Or, you can tease the hair with a thin comb and pin it at the back. Once the bouffant is in place, pick up hair from both the sides, twist them, and pin them just below the bouffant. Spritz on some hairspray to secure the hairdo in place. Gather the hair from the mohawk section and clip up the rest of your hair. Divide the mohawk section into two sub-sections. 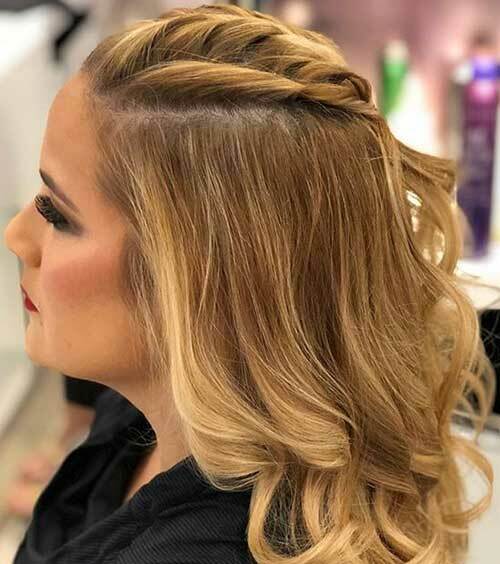 Weave both sections into Dutch braids until you reach the crown. Once you reach the crown, weave your braids regularly the rest of the way down. Roll up the regular braids to form two space buns. Secure the buns with elastic bands and bobby pins. Pancake the space buns to make them look bigger and messier. Spritz on some hairspray to keep the hairdo intact. Section off the hair at the top (from side to side), till the crown. Divide this section into smaller sections. Twist each section from root to tip and pin them to the back of your head in an alternating pattern. Make sure you overlap the sections while pinning them to the hide the bobby pins from view. Spritz on some hairspray to set the half updo in place. Gather hair from the front and tie it in a half ponytail. Part the hair above the ponytail in half to create a gap and flip the ponytail through it twice. Take a small section of hair from the flipped ponytail and wrap it around the elastic band to hide it from view. Pin it in place. Weave a fishtail braid with the half ponytail. Once you’ve reached the halfway point of the braid, add in some hair from the sides. Before you add in the hair (in place of the corner sections of the braid), divide it into half and twist it. Do the same with the hair on the other side. After this, start adding hair to the braid, combing it as you do. This will make it neat. 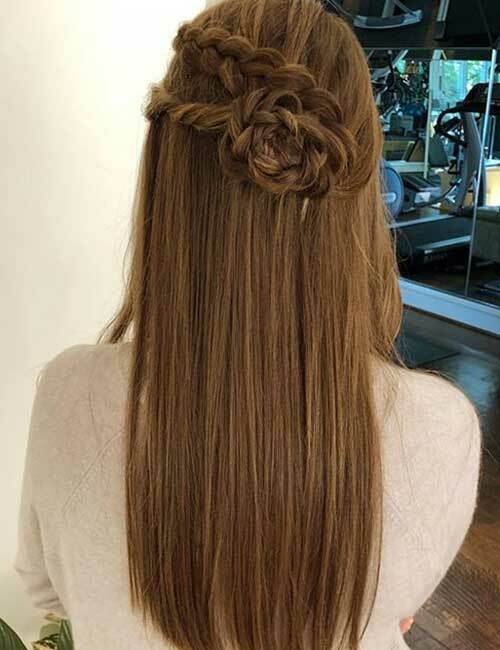 After adding about three to four sections of hair, weave the fishtail braid without adding any hair and tie it at the end with an elastic band. Wrap some hair around the elastic band to cover it, tucking the ends within the band. Hit the ‘do with some hairspray to set it in place. Section off the hair right at the front, about 2 inches away from your front hairline. Gather enough hair at the top to cover the chignon maker. Place it at the crown of your head and cover it with the hair. Divide the front section of hair into smaller sections. Twist loosely and place each section over the bouffant. 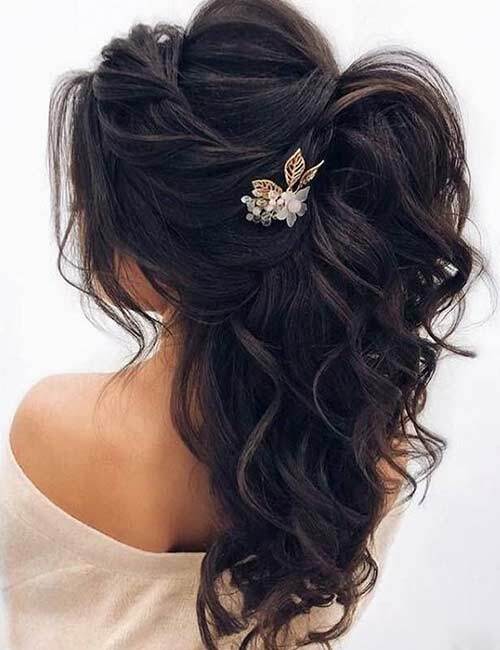 Curl the ends of your hair and spritz on some hairspray to set the hairstyle in place. Add a lovely accessory to finish off the look. Curl your hair into perfect ringlets. Gather some hair from the top of your head and pull it back. Pin it back at the center. Criss-cross and pin the rest of the hair, until you reach the final section beginning right near your ear. This time, criss-cross the sections, so they look connected and pin them in place. 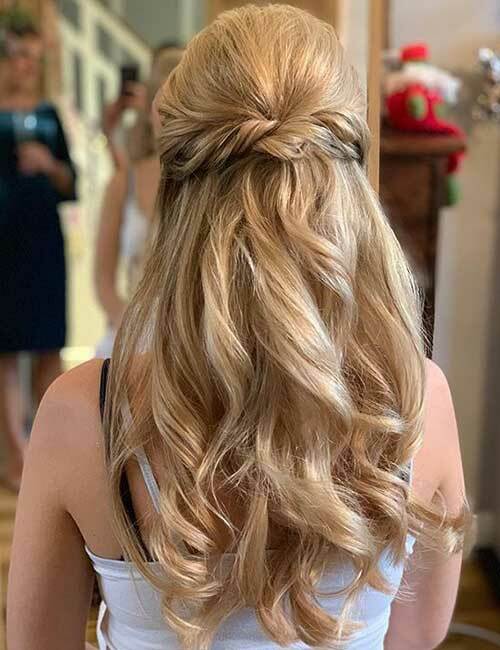 Backcomb the hair at the crown of your head and pin it down to create a bouffant. Take a section of hair from one side, twist it, and pin it at the back. Pick up another section of hair from the other side and do the same. Don’t forget to spritz on some hairspray! Brush your hair thoroughly to remove all knots. Gather hair from the mohawk section and weave a French braid until you reach the crown. Tie it securely with an elastic band. Pick up some hair from beside the French braid, twist it, and pin it beneath the braid. Backcomb the hair at the crown of your head. Start teasing your hair from the top and move down. Comb the top of the teased hair to make it look neat. 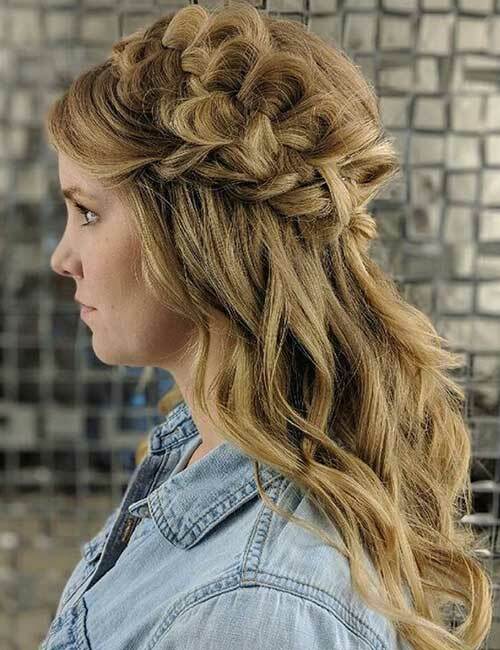 If you want to jazz it up a bit more, weave the lifted hair into a super loose French braid. Once you reach the crown, tie the rest of the hair from the section into a top knot. Secure it in place with an elastic band and bobby pins. 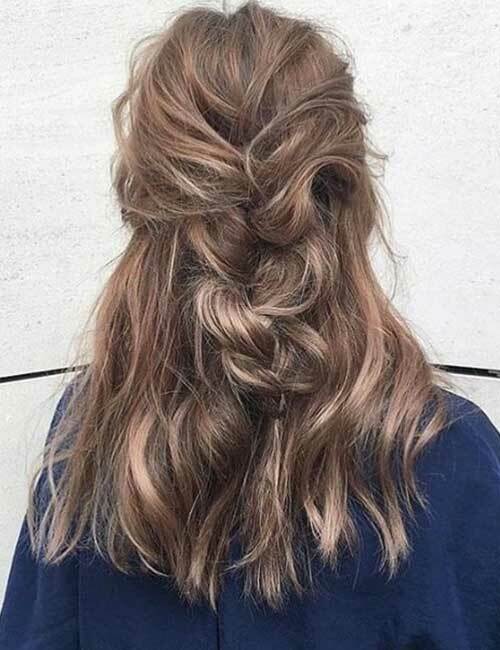 Pancake the knot to make it look messy, and spritz on some hairspray to secure it in place. Create a bouffant and pin it in place. You can use a chignon maker to make the bouffant bigger. Pick up hair from both the sides and twist it. Pull both the twists back and weave them into fishtail braids. Pin the braids at the back of your head and pancake them to add volume. Finish off with a hit of hairspray to set the ‘do in place. Gather hair from the front till the crown and tie it in a half ponytail. Part the hair just above the elastic band to create a gap and flip the ponytail through it twice. Take some hair from one side and twist it. Wrap it around the elastic band of the half ponytail and pin it in place. Don’t forget to hit the hairdo with some hairspray to tame down any flyaways. 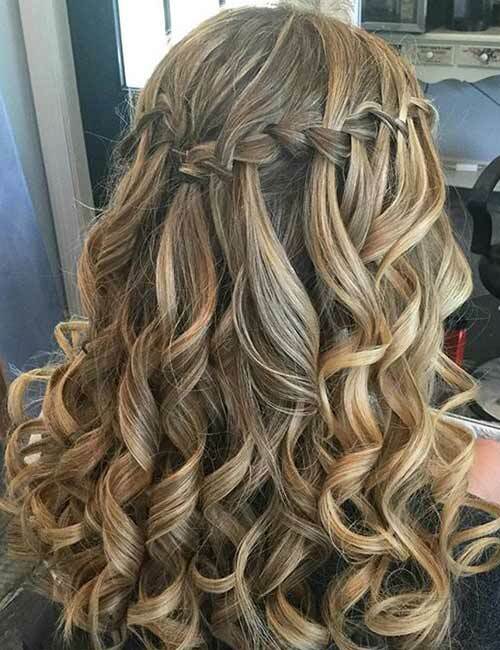 Apply curl defining cream after washing your hair the night before prom. Tie a silk scarf around your hair and leave it on overnight. This prevents your curls from becoming frizzy and adds definition to each coil. Remove the scarf and let your fierce curls shine through. Gather hair from both sides and clip it at the back below the crown. Instead of using simple bobby pins, use a designer barrette. Leaving out some hair at the from, gather all the hair at the top and crown of your head, and clip it up. Part the hair in the front down the middle. Begin weaving a crown braid on one side of the parting. Once you reach the back of your head, pin it in place. Unclip the hair at the crown and tie it in a top knot. Secure it in place with the help of an elastic band and bobby pins. Curl your hair. 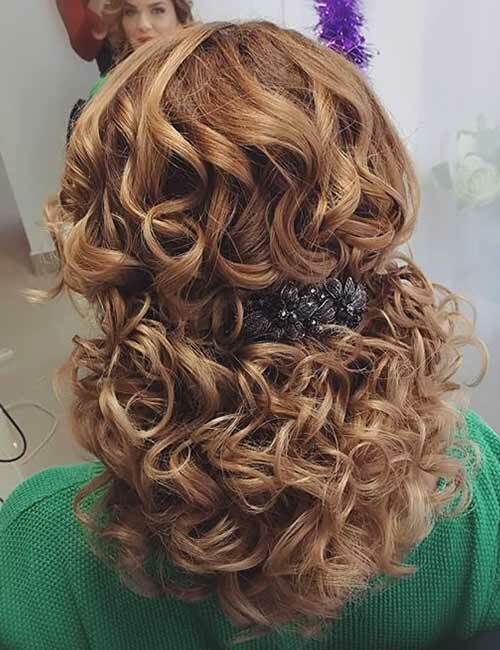 Keep your hair in the curling iron for about five to seven seconds to obtain perfect ringlets. Pick up a section of hair from the front and divide it into three parts: two side sections and a middle section. Weave a stitch of braid, then drop the top section. Pick up a new section of hair from the top. Weave another stitch and drop it. Continue this way for all the stitches, following the curve of your head as you braid. Once you reach the back of your head, secure the braid with pins. Repeat steps 3 to 6 on the other side. Join the tails of both the braids at the back and tie them in a half ponytail. Wrap a small section of hair around the elastic band to conceal it and secure it in place with a bobby pin. Finish off the look with some hairspray. Pick three sections of hair from each side (a total of six sections). Divide each section into half and twist the sub-sections around each other. Do the same with the other sections. You can use elastic bands to secure them. Pin all the twists at the back of your head and remove all the elastic bands. Un-twist the hair below the pins and brush it out. Pick up a medium-sized section of hair from below the pins. Divide this section into two sub-sections and twist them around each other. 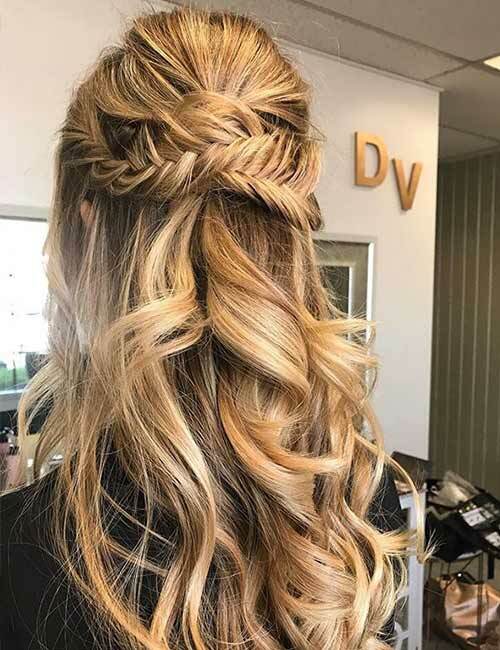 Backcomb the hair at the crown of your head to create a pouf. Leaving out the hair at the front, pick up the sides of the pouf and overlap them. Secure the pouf with an elastic band and bobby pins. Part the hair in the front in a deep side parting. Divide the hair into smaller sub-sections. Create loose twists with each sub-section. Pin the twists underneath the pouf and add a fancy hair accessory to jazz it up. Brush your hair and curl it from midway down. Comb your hair back and clip it up in a half ponytail using bobby pins. Pick up some hair from the half ponytail and fold it upwards. 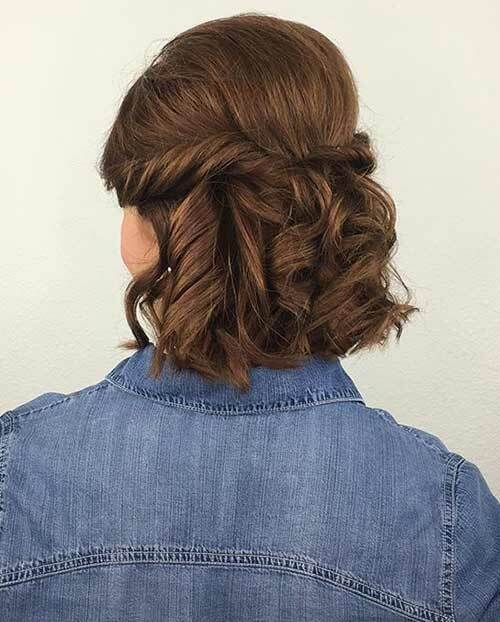 Pin this rolled bun on top of the bobby pins at the back of your head. Curl your hair and hit it with some hairspray. 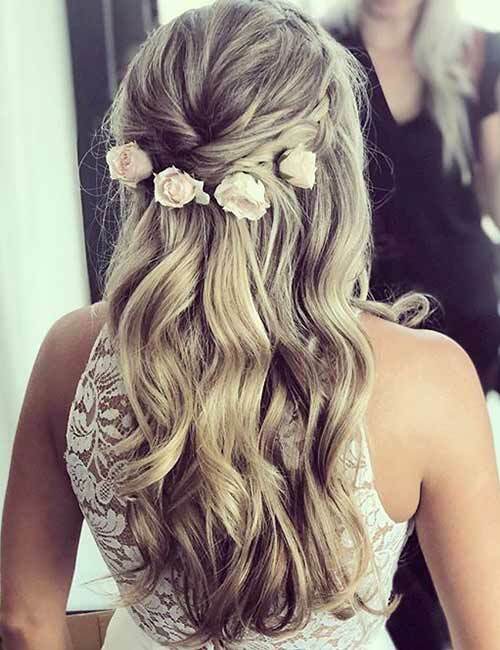 Take a small section of hair and roll it up to form a rose. Pin it up with bobby pins that are the same color as your hair. Make as many roses with your hair as you want and pin them up along the sides and back of your head. Accessorize with some simple beads and small flower pins. Divide your hair horizontally into three sections: top, middle, and bottom sections. 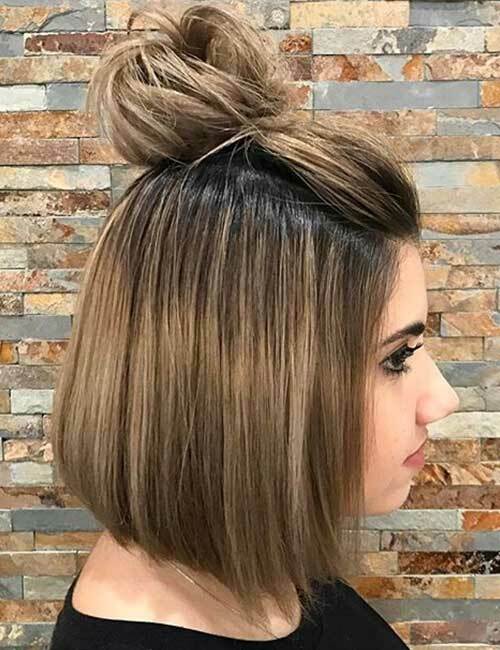 Tease the hair in the top section to form a pouf. Secure the pouf in place with bobby pins. Pin the hair in the middle section like a half ponytail. Make sure it looks connected to the top section. Pin up the lower section like a low ponytail. Again, make sure it looks connected to the middle section. Spritz on a good amount of hairspray to set it in place. Curl your hair and spritz some hairspray on it. 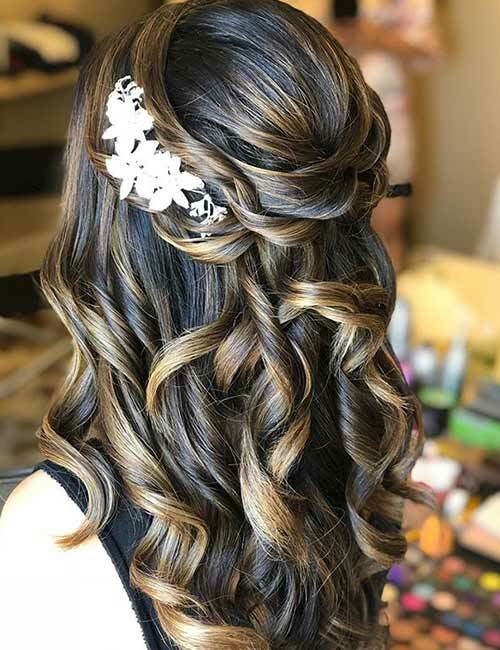 This will lock in those curls and make them last all night. Brush out the curls gently to get those perfect Hollywood swirls. Take some hair from the front and tie it in a half ponytail. Create a gap in the hair above the elastic band and flip the ponytail up and through it. 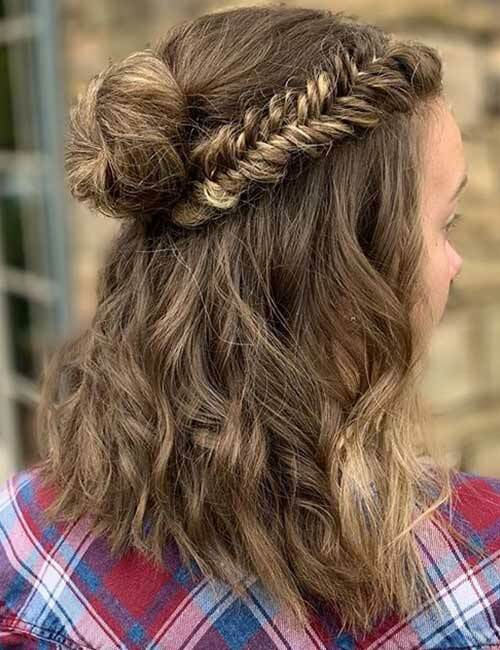 Pick up some hair from one side and Dutch braid it. Wrap it around the elastic band of the ponytail and pin it in place. Accessorize with some medium-sized flowers to finish off the look. Curl your hair with the curling iron. Gather some hair from the top and tease it to form a bouffant. 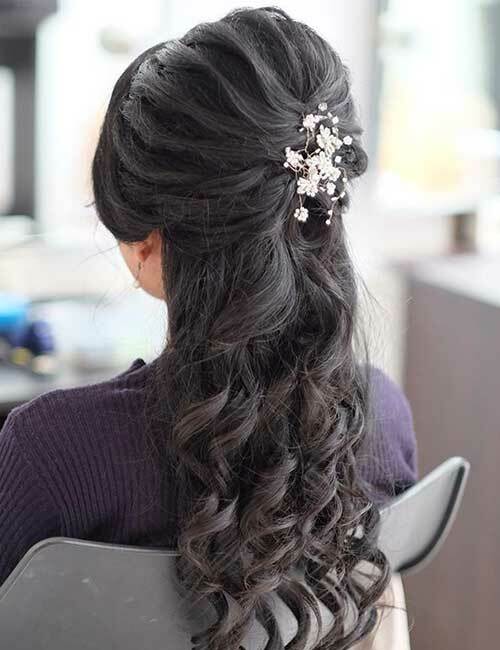 Wrap some curls around the bouffant to create a crown and pin them in place. Take a few curls and pin them up as you would a half ponytail. 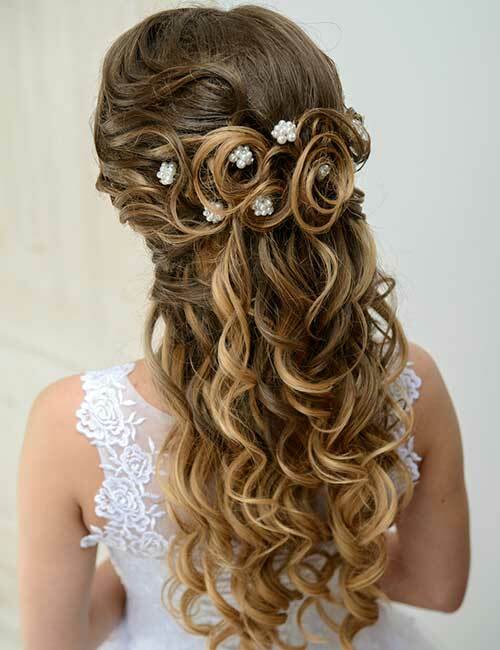 Add a final touch with a simple hair clip and some hairspray. Pick up some hair from the front left side and weave it in a fishtail braid. Keep adding hair to the top section of the braid as you go. Secure the end with an elastic band. Repeat the steps 1 and 2 on the other side. 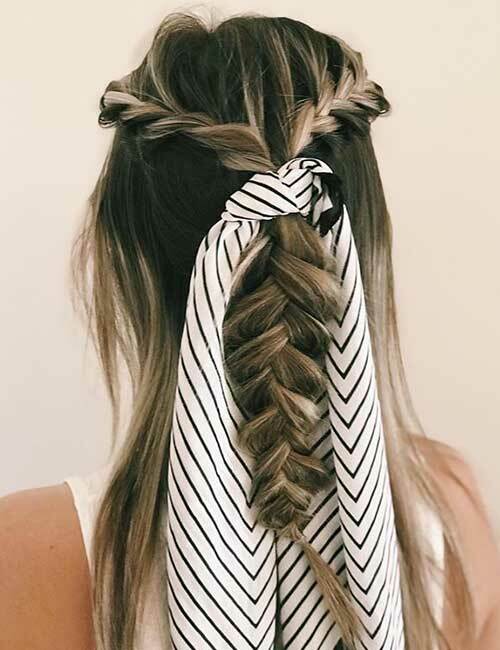 Join both the braids at the crown and tie them with a scarf. Weave a fishtail braid with the hair below the scarf and tie it at the end with an elastic band. Gather two sections of hair from the right side of your hair. Weave both sections in regular three-strand braids and secure them with elastic bands. Repeat steps 1 and 2 on the left side. Wrap the braids around the back of your head to form a crown, pinning them at the back. Pancake the braids to make them look voluminous. Take the hair at the front right side and weave it in a braid. Repeat the same on the left side as well. 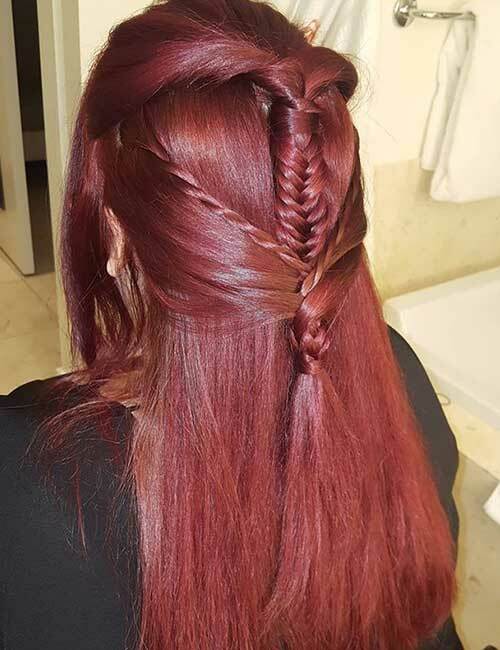 Overlap the braids at the back and pin them in place. 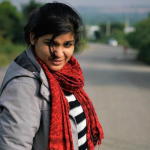 Gather some hair from either side of your hair. 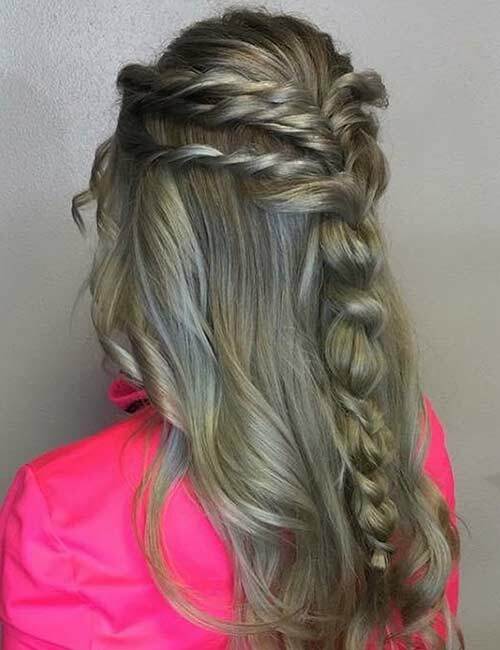 Weave it into a Dutch braid and secure it at the end with an elastic band. Take some more hair from just below the first braid and twist it. Wrap the braid around itself and pancake it to form the flower. Secure it in place with bobby pins. Wrap the twist around the flower and pin it in place. Gather the hair at the top and crown of your head. Pass your elastic band once over this section of hair. 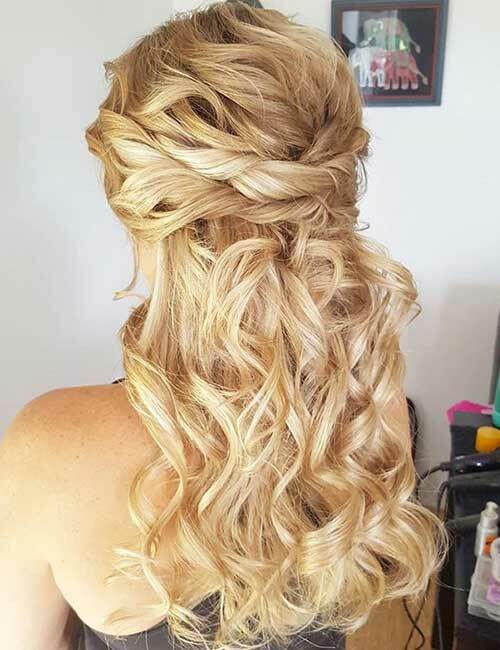 Twist the band and pass it only halfway over the hair. Twist the band and pass it halfway over the hair again. Pancake the top knot and secure it in place with bobby pins. Divide the top part of your hair into four sections. 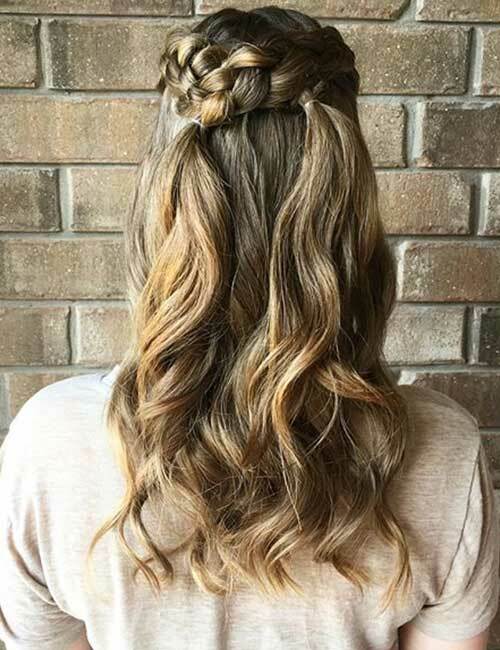 Weave each section in a French braid until you reach the crown and secure them with elastic bands. Gather the tails of all the braids and wrap them in a top knot. Secure the top knot in place with an elastic band and bobby pins. Spritz on some hairspray to set the ‘do in place. There you have it, ladies! 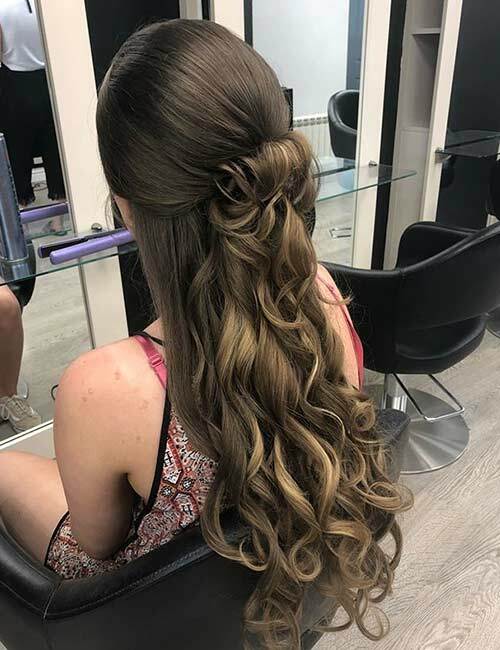 I hope these half up-half down hairstyles have given you enough inspiration for your prom hairdo. Which one will you try for your prom? Comment below and let me know. Here’s wishing you the best prom experience of your life!